A widely used green fluorescent dye for following synaptic activity by staining synaptic vesicles at the synapse or neuromuscular junctions. When used in combination with the red fluorescent dye SynaptoRed™ (70021), synapses or neuromuscular junctions can be imaged independently in two colors. Research results from the Tsien and Kay labs showed that brain slices can be stained with SynaptoGreen™ when SR101 (Sulforhodamine 101, 80101) or ADVASEP-7 (70029) is used to reduce the background staining. 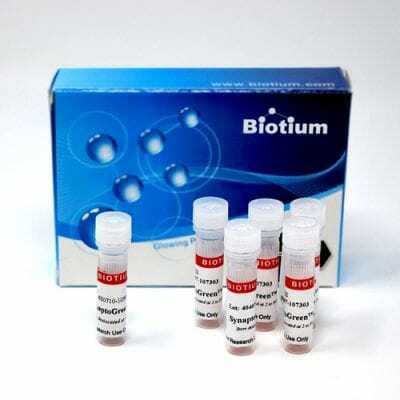 Biotium offers several Nerve Terminal Staining Kits for staining brain slices. Also see AM1-43 (70024), which is similar to SynaptoGreen™, but with a formaldehyde-fixable amine group. SynaptoGreen™ also can be used to stain bacteria (gram-positive or gram-negative) and yeast, although in yeast it rapidly internalizes to vacuolar membranes. See our Cellular Stains Table for more information on how our dyes stain various organisms. 1. J Neurosci 12, 363(1992).